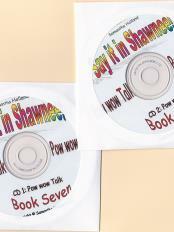 This is the seventh in a series of books emphasizing conversational Shawnee. My husband and I are often attending local Pow wows and want to converse about the dancing, singing, and drumming as well as dressing into our regalia. We meet friends and often talk about the weather and how we are all feeling. 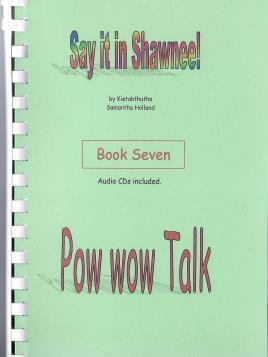 This 140 page book and 2 audio CD’s were created for coversational Shawnee language at the Pow wow. The Book includes a few greeting words and talk about the weather and how we are all feeling. It includes words about dancing, singing, drumming flute and other music words. It, also, includes words about dressing and regalia.